“An arm and a leg.” Discarded doll limbs at Collage, Portland, OR, 24 June 2012. “Broken Charlottes.” Damaged “Frozen Charlotte” dolls at Collage, Portland, OR, 24 June 2012. The arms and legs were for sale, $3 each, at Collage, a Portland crafts store where our upstairs neighbor works (hi, Sonya!). 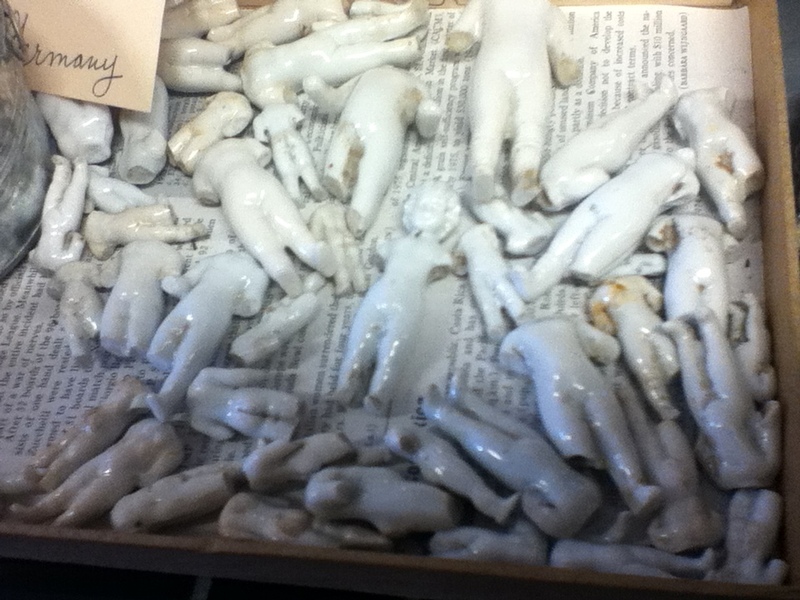 When our neighbor spotted me waxing enthusiastic over the body parts, she pointed out how some of the limbs seemed to be burned, and we started speculating on what sort of twisted ritual the dolls’ previous owners must have been conducting. Then Sonya rushed me around to another counter to show me the German broken “Frozen Charlotte” dolls, which she said someone had dug up and shipped to Portland. I was fascinated that only one of the Frozen Charlottes had a head! Looks a lot scary! Those Frozen Charlotte dolls give me the creeps even when they’re whole, unbroken. Just their name is eerie. But damaged, discarded, and dug up from the earth as though they were disinterred corpses? There’s so much to be scared of here!